OTTAWA, CANADA – May 11, 2016 – Corel today announced the release of AfterShot™ Pro 3. 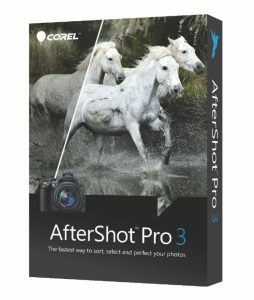 Building on its strength as the industry’s fastest photo editing and organization software, AfterShot Pro 3 adds an all-new Highlight Recovery algorithm, comprehensive Watermarking, layer-based Blemish Correction, as well as dynamic update abilities that enable new camera RAW profiles to be supported faster than ever. Photographers dream of capturing that perfect shot, but spending all day importing, cataloging, editing, and then exporting a memory card full of images can really take the fun out of a photo workflow. For the professional, time is money. And for enthusiasts, time is just as precious. From its inception, AfterShot Pro has been built to deliver on three core competencies: outstanding performance, superior productivity, and freedom of choice. It enables photographers to organize thousands, cull from hundreds, and perfect a single photo. AfterShot Pro 3 provides easy access to a variety of plug-ins and add-ons direct from the community. In Corel lab testing, it remains up to 4x faster than Adobe Lightroom CC 2015.5 at batch exporting. Building on its reputation as the industry’s fastest photo editor, AfterShot Pro 3 adds new and enhanced features to deliver a complete professional-level photo workflow and management experience. NEW! Highlight Recovery Algorithm: With an all-new algorithm under the hood, the enhanced Highlight Recovery Range slider now rescues more detail and tones from overexposed RAW images, delivering superior image quality. NEW! Comprehensive Watermarking: Protect your photos online and promote your work with advanced watermarking abilities. Apply watermarks to individual photos or batches, plus easily adjust size, rotation angle, position, transparency and more. NEW! Blemish Removal & Correction: Save time and edit faster by performing more non-destructive, layer-based touchups and corrections directly in AfterShot Pro 3, without exporting your image to a second editor like Photoshop or PaintShop® Pro. NEW! In-App Preset Library: Get access to a library of free and premium photo presets, regularly updated and hand-picked by the Corel Photo Team. Reproduce popular editing looks with the power of our included presets or apply them as a starting point and adjust to create your own. You can also share your creations with the community. NEW! Lens Correction Development Kit: Get ahead of the curve by making and sharing your own lens corrections—ideal for photographers working with rare or brand-new glass. Simply follow the lens correction instructions, save your profile, then load it into AfterShot Pro 3. NEW! Dynamic & Modular Camera Profile Updates: AfterShot Pro 3 now has the ability to deliver new and updated RAW profiles faster than ever before. With the modular delivery system, as soon as a new camera profile is created by our development team it’s made available for download directly in-app—no more waiting for the next update to support your new camera. NEW & ENHANCED! Plugin Development & Download Availability: The new in-app Plugin Manager finds and installs plugins in a flash. Extend any workflow with free plugins from the community, discover premium plugins (like the popular GradFilter Pro), and get the latest plugin updates all in one convenient place. Plus, plugin-developers can leverage our unique RAW-level plugin API and toolkit to build pro-quality plugins to tap into the full power of AfterShot’s processing pipeline. AfterShot Pro 3 is available now for Windows, Mac OS and Linux in English, German and Japanese. Suggested retail pricing is £69.99/EUR 89.99 and existing registered users can purchase for the upgrade price of £49.99/EUR 69.99. All prices include VAT. To download a fully-functional, 30-day trial or for more information on Corel® AfterShot™ Pro 3, please visit www.AfterShotPro.com. Information on volume licensing for commercial and education organizations is available at www.corel.com/licensing or by contacting VLP@corel.com. Visit Points of View, the Corel Photo blog to learn more about AfterShot Pro at http://blog.paintshoppro.com and connect with other AfterShot Pro users on Facebook (facebook.com/corelaftershotpro). Whether you’re an enthusiast or professional photographer, Corel Photo Editing software is dedicated to helping you achieve your best photos ever. The Corel Photo Editing product lineup includes the renowned PaintShop® Pro for powerful image editing and AfterShot™ Pro, the industry’s fastest RAW photo workflow software. Corel is one of the world’s top software companies providing some of the industry’s best-known brands including CorelDRAW® Graphics Suite, Corel® Painter®, Roxio®, Pinnacle™ and WinZip®. For more information about Corel Photo Editing software, please visit www.PaintShopPro.com. Benchmark results based on internal tests performed by Corel Corporation using AfterShot Pro 3 batch export versus Lightroom CC 2015.5. Visit us for more information at http://corl.co/1Xjtw20.